Banish thunderstorm freak-outs! Our soothing, calming mix gently helps ease the anxiety and tension from everyday stresses, loud noises and big events. Tryptophan is a combination of well-known natural calmatives. Plus, the ancient Greeks used Valerian Root for a variety of temporary conditions, such as sleeplessness and nervousness. Looking for the next thing in "treat" container. Try these stylish jars out. 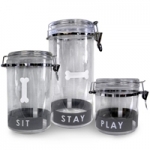 Available in 3 sizes, lids clamp securely in place and look great on any kitchen counter. 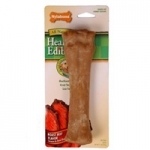 Our Nylabone Romp'n Chomp Shish-ka-bone Dog Chew is designed for powerful chewers and helps satisfy their natural urge to chew. 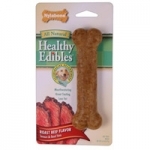 Nylabone Healthy Edibles are tasty, completely edible and digestible providing a safe and enjoyable alternative to traditional rawhide. NO plastic and NO added sugar. 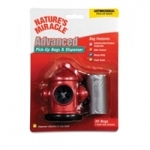 NATURE’S MIRACLE™ Advanced Dispenser (with included pick-up bags) is a convenient, on-the-go solution for picking up after your dog. 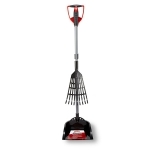 NATURE’S MIRACLE™ 2-in-1 Rake and Spade with Pan is an ideal solution for cleaning up your dog’s waste quickly and efficiently. Our easily convertible design switches between rake and spade for waste clean-up on multiple surfaces, including grass, gravel, and concrete. 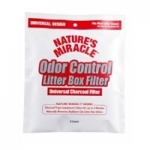 Antimicrobial product protection inhibits the growth of odor-causing bacteria and odor-block technology prevents pet odors from being absorbed into the plastic. A non-stick surface makes clean-up quick and easy. 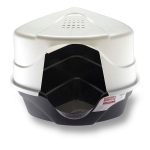 NATURE’S MIRACLE™ Advanced Jaw Scoop offers an easy-to-use, no-mess solution for managing your pet’s waste. 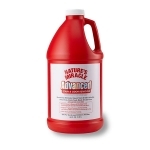 Our lightweight design features antimicrobial product protection that inhibits odors caused by bacteria and picks up waste from all surfaces, including grass, gravel, and concrete. A non-stick surface makes clean-up easy and odor-blocking technology prevents your pet’s odors from being absorbed into the plastic.